A travelling "corps de ballet" is stranded in a small Western town, when one member falls ill with malaria. By coincidence, the town is being terrorized by an outlaw named El Diablo. In order to hold the town at bay, he is holding several citizens as hostages. 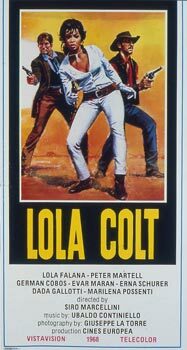 In an exciting turn of events, a medical student and Lola Colt, one of the dancers, rescue the hostages and put El Diablo on the run. Peace returns. An unusual, exciting western.